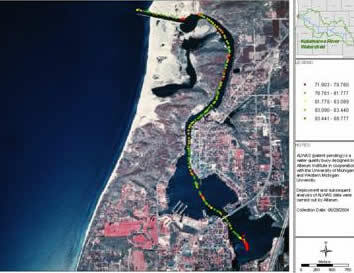 Michigan Tech Research Institute (MTRI) and the University of Michigan Marine Hydrodynamic Lab’s Automated Lagrangian Water Quality Assessment System (ALWAS) is an inexpensive, free-floating, water quality measuring and watershed evaluation system. It is capable of making a wide range of measurements rapidly and easily and storing the results for later retrieval and analysis. Current water quality sampling methods involve collecting water samples in the field and then returning them to a laboratory for measurement, or consist of manually inserting an array of expensive equipment into the water to be measured. These manually measured results may then be hand-analyzed, but typically are not further processed. In contrast, ALWAS automatically takes measurements as often as every 40 seconds, and uploads the results to a software package for processing and insertion into a geographic information system (GIS) for more sophisticated review and display. The system includes the buoy, water quality sensors, a microprocessor and recording device, GIS interface software, and a decision support system (DSS) that generates water quality maps based on the measurements. 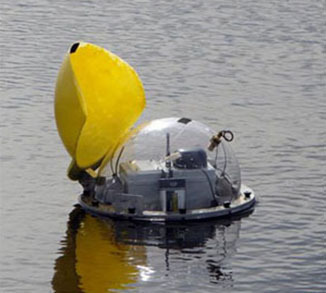 The buoy, as presently configured, measures the following parameters at a user-selectable rate: GPS Data, including geographic location (latitude and longitude), speed and heading, quality metric, number of visible satellites, time and date. Water Properties, including temperature, depth, conductivity, salinity, total dissolved solids, pH, dissolved oxygen, turbidity, chlorophyll-a, oxidation reduction potential, nitrate, ammonium, chloride and blue-green algae. Ancillary data, including barometric pressure, battery voltage and remaining memory.